Lahore, December 11, 2014: Pakistan’s most anticipated bridal show, Telenor Bridal Couture Week (TBCW) began with glitz and glamour here at the Faletti’s Hotel, Lahore. Showcasing the latest bridal trends of the region, the three-day event was all set to showcase never-seen-before bridal wear trends. The mega fashion event was managed by HUM Network Ltd. in collaboration with Telenor. TBCW endeavours to promote Pakistan’s seasoned and aspiring fashion talent both on the domestic and international platform. Day 1 of this three-day fashion extravaganza kicked off with the incredible collection of Zahid Khan, the genius behind Kuki Concepts. His TBCW collection, Parisa was a tribute to the bride, traditions, customs and values of the east. Inspired by the dreams and myths of the legends, Parisa received huge appreciation from the audiences and critics. Next to showcase was the dramatic collection by Ali Xeeshan, presented by Q Mobile. His collection Daastan was inspired by the iconic movie Mughal-e-Azam. 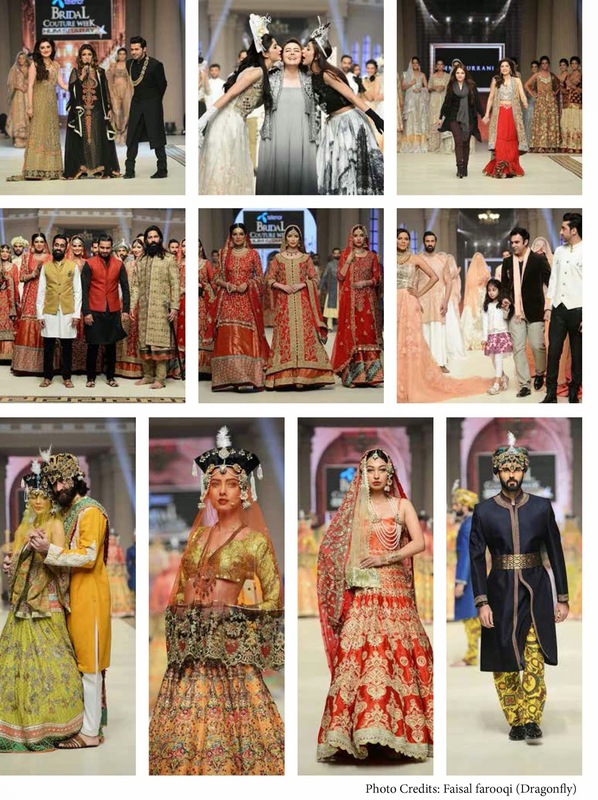 Ali Xeeshan’s Luxe bridal collection took the audience back in time to the Mughal Empire of the legendary Anarkali. Palette, cuts, silhouettes, fabrics and rich embellishments used in this collection paid tribute to the golden era of the Mughal Empire. Staying true to the commitment of the Bridal Couture Week to supporting aspiring talent and providing a platform to young and deserving designers, Telenor presented Fozia Hammad’s “Goal”, a tribute to the Mughal City of Gardens. Fozia Hammad’s collection testified that Lahore is a city that creates loyalties. Her TBCW 2014 collection, Laila-e-Lahore was primarily a tribute to the city that has shaped her design aesthetics. It was the mood of the millennium-old-metropolis that the collection represented wherein Lahore itself came across as one big motif. This artistic endeavour by Hammad underlined a simple belief: New York is enormous, London is convenient and Paris is beautiful…but…Lahore is Lahore. Closing Show One of Day One was Tena Durrani who presented her collection, a tribute to the contemporary bride – a progressive woman who has a very particular sense of style. With an identity that is deeply rooted in timeless, classic traditions, Tena Durrani’s bridal collection fell within the realms of a bride for all seasons. Her TBCW collection ‘Perenia Progressive’ used traditional crafts like kamdani and French knots and employed new techniques to weave outfits in pastels and rich colours, that resulted in a truly unique, yet eternal bridal collection. Maria B’s ‘Rose Garden’ was the first collection of Day One Show Two, treating the attendees to a dreamy and feminine collection set in 18th century France. The European cuts, embroideries and palette all had a nostalgic and vintage feel.... yet the collection was current in its silhouette and was designed for the modern bride. Next to showcase was Ziggi Menswear, the first ever UK brand to participate in the Bridal Couture Week. Ziggi Menswear presented their 2015 collection, Musafir, an amalgamation of traditional embroidery methods such as beads, zardosi, dabka, kora, arri work, pita work, velvet appliqués, and the best of traditional English tailoring. Inspired by our culture, heritage and architecture, Musafir was heavily influenced by the euphoria of ancient mysticism. The palette used was maroon, gold, sand and a hint of blue. The collection was completed using Ziggi Menswear’s signature regal fabrics – brocades, tanchoi silks, raw silks and velvet. The collection gave the wearers a well-fitted and structured, enhanced look, exuding grace and confidence. Ziggi Menswear’s sister concern, Mehzabeen, also showcased their capsule collection, Gulnari, which was all about grace and elegance. Gulanari embodied the essence of a traditional bride, heritage and old world charm in each individual piece. All the pieces were predominately red with a hint of turquoise, purples, pink and green. Embroidery was well-balanced throughout the capsule collection which consisted of farshi ghararas, lehngas, long trail gowns, A-line dresses made from chiffons, organza, velvets, brocade and Indian jamavar silks which fall with grace, and elegance. Ziggi Menswear was followed by a hair and make-up presentation by Nabila, featuring the season’s hottest hair and make-up trends. 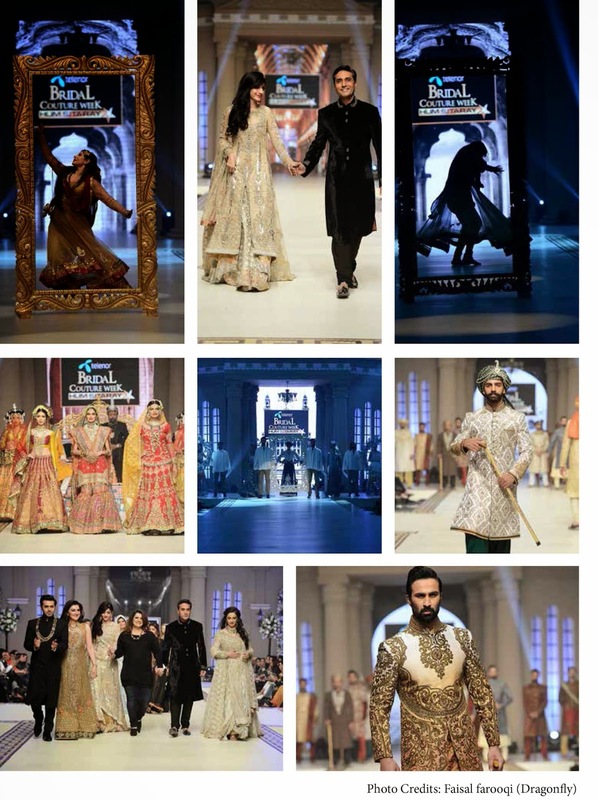 The first day of Telenor Bridal Couture Week concluded with a mega fashion showcase by the inimitable Faraz Manan. Each season Faraz Manan brings the world to our feet with his creations and the story behind each piece. Through his extensive travels, he takes inspiration from architecture, interiors, culture and various people for his collections. From Lyallpur to Istanbul to Shanghai, Faraz Manan has transported us everywhere and now did a full circle, taking us back to our roots, to our culturally enriched city, Lahore. His collection was a tribute to Lahore and what it entails…culture, tradition, festivities, heritage and hospitality. Contemporary yet eastern, his couture collection was particularly designed focusing on the festive wedding season. In sync with the vibrant life of Lahore, there were vivid colours. The palette contained coral, shades of red, gold and black, featuring diversity in bespoke designs, and variations in shirts, jackets, saris and bridals. The show was produced by the in-house team of HUM Network, choreographed by the designer and choreographer extraordinaire HSY, with backstage management by Production . The make-up and grooming was done by N-Pro and N-Gents. The event was powered by Q Mobile and co-sponsored by Tapal Green Tea. FM106.2 was the official radio partner; snack partner was Peak Freans, with Nestle Pure Life as an associate sponsor, and fragrance partner was Junaid Jamshed J. TBCW was refreshed by Diet PEPSI. Faisal Farooqui and his team at Dragonfly along with in-house photographer, Haris Usmani were engaged for all official photography of the event. PR of the event was handled by the PR department of HUM Network Ltd.